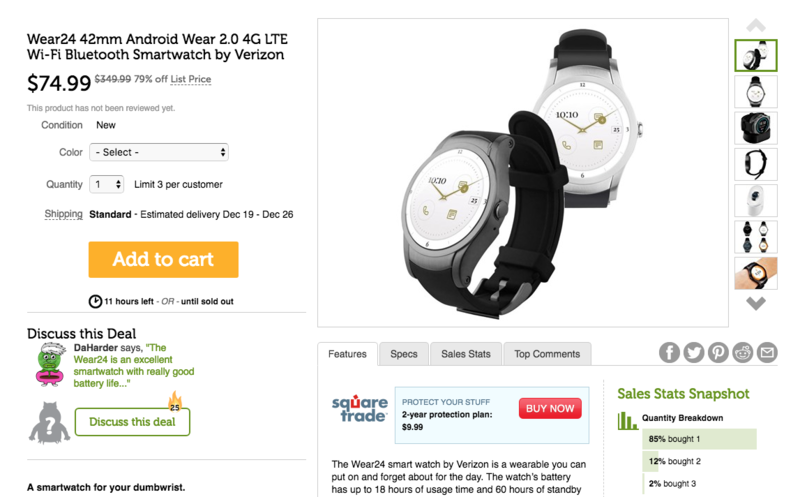 Not many people are interested in paying $349.99 for a smartwatch, which is probably why Verizon's Wear24 didn't do too hotly prior to its discontinuation. However, we've been seeing some incredible deals since then. Matching the lowest price we've seen thus far, Woot is offering new Wear 24s for just $74.99 (plus $5 for shipping) a pop. The Wear24 features a 1.39" 480p OLED, a Snapdragon 2100, 768MB of RAM, 4GB of storage, and a beefy 450mAh battery. Other features include LTE (obviously), GPS, NFC (though it doesn't support Android Pay), and Android Wear 2.0. These are probably the best specifications you can get out of any smartwatch for the money, though you should be aware that update support is probably over. Woot has the Gunmetal Black and Stainless Steel colors in stock. Purchase quantity is limited to three per customer. As mentioned previously, shipping is $5 on top of the $74.99 shown on the site, effectively making the price the same $79.99 we saw on eBay a few weeks back. There are eleven hours until this deal ends, so don't wait if you want one (or three).